CUSTOM SHINGLE STYLE RESIDENCE by ALEXANDRA FINE HOMES - Alexandra Fine Homes Inc.
Here’s a beautiful Alexandra-designed custom shingle style home we’ve completed for fantastic clients in Bainbridge, Ohio. Our design inspiration began with our client’s desire for a family home evoking the traditional charm of New England’s seaside vacation abodes. 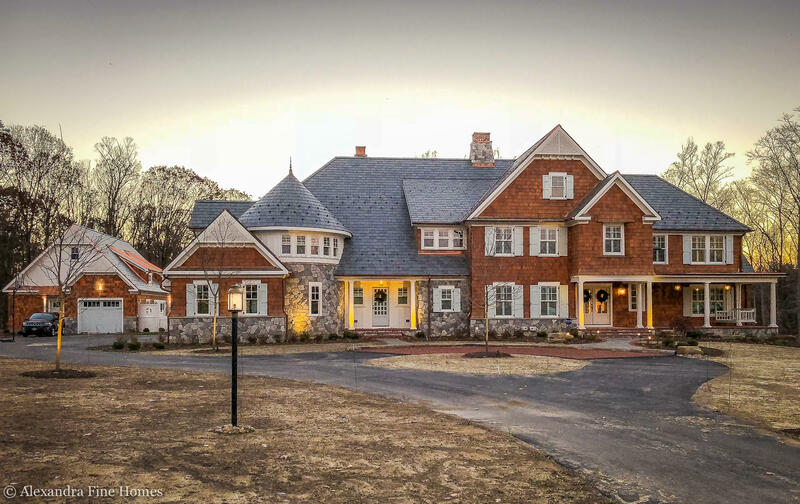 Natural cedar shake cladding, operable shutters, rubble-laid stone, slate roof, copper gutters, classical trim details, and a beautifully scaled turret create an impressive yet very welcoming curb appeal. The natural materials will weather gracefully, further adding to the casual elegance and dramatic allure of this very special residence. Custom Shingle Style Residence (rear elevation). Designed & built exclusively by Alexandra Fine Homes. The rear elevation features large porches overlooking a beautiful pool & landscape. A complimentary separate “man-cave” structure also overlooks the pool, and is complete with heated floors, custom ventilated cigar area, full wet bar, TV lounge, and ample workshop and display areas for vintage automobiles and motorcycles. See more of our award-winning work HERE, and stay tuned for more photos of this spectacular home as we complete another gorgeous Alexandra Fine Homes original! Ever notice that many “custom” builders’ homes are similar and look subdivision-ish? Most clients are surprised at how affordable and competitive our boutique design/build services and award-winning homes are compared to other builders in our marketplace. Why settle for a nice home, when you can have an extraordinary original at a similar cost? Let’s talk and see if there’s a match. No strings, no sales pitches. Call 440-557-5166 or click here and let’s have a chat today. ← Alexandra Wins 2017 Custom Home(s) of the Year!